Every morning, the fine folks at Sports Radio Interviews sift through the a.m. drive-time chatter to bring you the best interviews with coaches, players, and personalities across the sports landscape. Today: California state senator and unconfirmed degenerate gambler Roderick Wright. 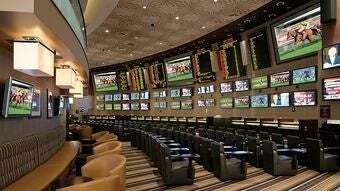 Currently in the United States, if you want to make a (legal) wager on the outcome of a sporting event, your options are limited to sports books in Delaware, Oregon, and Nevada. California state senator Roderick Wright (D-Inglewood) wants to see those options expanded. Wright stopped by ESPN Radio Los Angeles with Mason and Ireland to discuss why he wants Californians to be able to bet on 49ers games and what obstacles are in the way of making that dream a reality. "You're talking about an industry that's already a multi-billion dollar industry in the United States. We allow three states – Oregon, Delaware and Nevada – to have sports betting. In addition, if you take the internet that is kinda-sorta now going – internet poker in particular but some of the other online gaming that takes place – you're talking about an industry, in the United States, that's probably close to $15 to $20 billion a year already." "If you said to me, if I could prevent people from gambling, if I could stop it and make it work, [I would]. But if you look at the history of this country, our success in preventing people from doing what they want to do has not been very good." "That's factually inaccurate. What we've found, for example, in our lottery, is that you look at it two ways. … A dollar from a guy who only makes $20,000 is a bigger piece of his revenue, that's absolutely right. But what you find is that the more affluent the neighborhood, the greater the handle on the people who play the lottery. The people who have more money tend to play more." "We're looking at it. When you talk about gaming or alcohol or prostitution, there's kind of a push-back from people. … But particularly in this lawsuit, we're talking about sports betting. I'm not a lawyer, but the lawyers to whom I've spoken, it's kind of an equal-protection portion of the federal constitution. How am I able to do something in Oregon that I can't do in California. What is it about Oregon that gives them a privilege that a guy in San Francisco can't have?" "In order to get sports betting, the first thing that would have to happen is that the … Bill Bradley law would have to be overturned, and that would only happen in a court. Then, after the Bradley Law is overturned … after that occurs, then California would have to affirmatively opt into a scheme that would allow it to be done." Pacquiao vs. Margarito in Mexico?